I am not (not!) exaggerating when I say this quick, creamy garlic alfredo sauce has changed how I view non-dinner nights. You know. Those nights when dinner just ain’t happening. Too many things going on. Too lazy (who, me??). Too many nights of husband being out of town. Too many kids needing attention. Too many weeks pregnant (yes, that is a subliminal announcement!). Too many this. Too many that. The problem is, on nights like that, I just can’t handle the thought of dinner approaching and knowing I’m going to have to scrounge up something my kids will eat but I’ll probably find gag-worthy. I can’t help it. Grilled cheese only gets me through so many nights. Enter this sauce. Fast. Unbelievably fast, and incredibly creamy and flavorful, this alfredo sauce is what I’ve been searching for the past five years. Healthier (relatively) than the versions loaded with butter and cream, it comes together quickly and wonderfully and it reheats beautifully the next day if you are lucky enough to have leftovers. We’ve made this no less than 10 times in the last month, and I have never, and I mean never, seen my kids gobble up anything so quickly. In fact, they beg for it every night and have requested it for their birthday dinners every year until they turn 42. Hopefully by then someone else will be making it for them, otherwise, we’ll have larger issues than just alfredo sauce overload. Embarrassingly, I have to admit, this sauce is even on the menu this week. I actually planned it that way. I mean, eating it at least once was inevitable, so I might as well add it in to the menu plan so I don’t look like a total slacker. In a medium pot or skillet, melt the butter over medium heat. Add the garlic and cook for about 2 minutes, stirring constantly, taking care not to let the garlic burn. Add the cream cheese, stirring with a whisk until the mixture is smooth. It will look curdled at first, but with constant whisking for 2-3 minutes, it should come together to form a smooth, creamy paste. Add the milk gradually, about 1/4 cup at a time, whisking quickly and constantly until each addition is incorporated fully into the sauce. Stir in the Parmesan cheese, pepper and salt. Stir until the cheese is melted and the sauce is the desired consistency. Cook for 2-3 minutes for a thicker sauce or remove right after the cheese is melted for a thinner sauce. Serve immediately over hot, cooked noodles. I've only ever used 1% milk in this sauce and it works great for our tastes. Also, I've made it with regular and low-fat cream cheese. The low-fat cream cheese gives it a slightly, very slightly grainy texture, but the cut in calories is worth it, in my opinion, although the full-fat cream cheese offers a luxurious, creamy texture that can't be beat. You choose! This was AMAZING. I’ve always loved the idea of Alfredo, but it has never really worked out for me. This recipe is so easy and turns out perfect every time! I have tried many different alfredo sauces and none of them were as creamy and thick as I wanted. I made this one and the search is over! My family LOVED it and so did I. Very quick recipe and really delicious! One question – can you jar it to use later? I don’t think it’s safe to can it and keep it on the pantry shelves, but you can keep it in the refrigerator for probably about a week. I made this last last night for the first time last night and it was delicious! I cooked up some shrimp scampi style and put them and the sauce over whole wheat penne. My wife loved it. We will definitely make it again. I love Anna’s idea of putting it over spaghetti squash. Thanks for a great recipe! My dinner plans didn’t work out, so I had to find something last minute. I made this sauce with what I had: some aged Gouda, Monterrey jack cheese subbed for the Parmesan, and I used heavy cream + water to sub for the milk. It worked and tasted great! This sauce is perfect! I make it regularly for a delicious and easy dinner. This, like so many other AMAZING recipes on this website, is a dinner go-to in my household. Here I am, making it again, and I don’t know why I haven’t left a review yet. It is delicious, simple and even better than any version at a restaurant. Thanks again for a great recipe, Mel! This is simple to make, but so delicious!!! Everyone loves it. It is always a hurt whenever I make it. Thank you. I made this last night, and it was a huge hit! I seared chicken, and made the sauce in the same pan. Delicious! ‘‘Tis is the best ever recipe. Mel, my family loves this recipe. In fact, my husband refuses to eat the nasty store bought kind anymore. We use it so much I’m wondering if there is a way to freeze it, or can it? I’d love to make a big batch and have it ready for even quicker use. Do you know if this would freeze well? Or can it be canned? I have no idea how to can food, but I would figure it out if it meant I could have this in bulk!. I’m not sure about canning it, Kristi – it would have to be pressure canned and I have no idea of the food safety or pH levels. But it can definitely be frozen! It might be slightly more watery after defrosting, but someone else just commented on a recipe similar to this that they froze in small portions and it was great after thawing and reheating. Judging by the pictures, it sure doesn’t make much! I LOVE my pasta SWIMMING in sauce…. so when I’m done, it takes TWO slices of Brown Garlic Toast to sop it all up! Quick and easy, our family makes it on a regular basis. It also makes a good chicken alfredo pizza. I made this two nights ago. You were right, it is very easy! I used light cream cheese (all I had) and I did not notice the grainy texture at all. I ate some leftovers today and they were still very yummy! HI Mel, I made this recipe before and my kids love it! They want this for dinner tonight but I’m out of parmesan cheese. Do you think this would work with pecorino Romano cheese instead? I’ve made it with Pecorino before. It’s good – but the flavor was a little strong for my kids. I make this on an almost weekly basis. A family favorite and so easy to make! Thanks Mel! Delicious! My family ask for this meal several times every month! Not too greasy and it comes together quick. Finally an Alfredo sauce I can make. And my whole family liked it!! We love this sauce! Sometimes to mix it up I double the recipe and put in a can of diced tomatoes and some ground sausage. It makes this amazing lasagna – like sauce and we love it!! Thank you Mel!! The pop-up and moving ads on this pager are nuts. Can’t handle it. My father is notoriously difficult to cook for and he recently decided to drop in at my apartment for a surprise dinner. After repeated reassurances that he would like this, I whipped together your magical recipe, grilled some chicken, threw in some steamed veggies, and I was left with a table of happy campers. In fact, I was told that I should have left all the “stuff” out because the sauce was that good. After they left, I got a text from my mom asking for the recipe because my dad was already requesting they make it themselves. I am officially indebted to you! I just wanted to write and say THANK YOU. I love every recipe of yours I’ve tried (and that’s lots!) but this one has truly been not only a favorite but a lifesaver. I, too, am pregnant–with #4–and morningsickness is always a bugger for me. We’re talking weeks on end of only eating takeout because I literally cannot cook without getting sick. But I was able to make this tonight! And it was perfect. Did you know that the inventor of fettuccine Alfredo reportedly created it to satisfy his wife’s pregnancy cravings for something warm and comforting? That’s exactly what this has been, and easy too. Thank you again. I’m so happy to hear that, Catherine! Good luck with your pregnancy! I have so many recipes from this blog in my binder o’ recipes, and this is the one that is always my go-to when I don’t know what to make or don’t have other ingredients on hand – I always have some cream cheese in the fridge, and if you can get a $1 brick of cream cheese this is also super inexpensive! LOVE IT. I wish I could lick all the leftovers out of the saucepan (I mean, maybe I still do… please don’t tell anyone). I find that the recipe as stated is perfect for two people (or for just me, one dinner + one lunch the next day, although reheating in the microwave is a bit meh). Also it lends itself to so many variations – the tuscan variation with basil and sun dried tomatoes is great, and I recently tried adding sauteed spinach and artichoke hearts for a spinach artichoke “dip” version. Everyone must try this. Interesting, I expected you to know that low fat dairy MAKES YOU FAT. In fact, pig Farmers give skim milk to pigs for the sole purpose of fattening them up. It’s worth since research if you don’t know this. I know this is several years old. So maybe you do now. But your recipes are AMAZING. Even though I’ve only tried the sloppy joes & go to French bread /rolls/buns I’ve saved more from your site than any other. I can tell just from reading them that they will be fantastic. And it helps that your family has similar likes as my family! Love your site! Tonight was 100% one of those non dinner nights. Mel to the rescue!! Thanks for this simple dinner. I’ve never frozen it but I think others have in the comment thread. Because of the high dairy content it might be a little grainy after it defrosts. I have been making this for about 5 years. The only thing I do differently is use regular cream cheese, extra garlic; LOVE garlic. I always add cooked chicken breast chunks. This sauce freezes wonderfully! I absolutely love this recipe and my family eats it for dinner at least once a month. It has been life and dinner saving. Thank you! I usually serve it on gnocchi and it is delicious! Hi Elyse – I’ve never made this in a larger quantity than quadrupling the recipe but if you have the time/willpower you could certainly make a couple really large batches. I wouldn’t suggest doing more than quadrupling each batch (so you’d need several quadrupled batches, I think). I have learned with this sauce that unfortunately, it doesn’t stay warm well in a crockpot (it gets kind of grainy especially if the heat is too high) so keep that in mind. Good luck! Hi Elyse – I just added salt and pepper to taste so yes, I probably went a little easy when adding everything else and tasted it at the end. Also, I think with a quadrupled recipe, I only added a double amount of Parmesan. This was really good. All 4 of us gobbled it right up! I doubled everything to make a bigger batch. I also subbed bagged, shredded parmesan-romano for the cheese. We added precooked chicken to ours at the end. Yum! Delicious! I had some frozen mushroom ravioli I coated in the sauce. I also sautéed shrimp in old bay, threw that in the sauce as well as some fresh spinach. After mixing sauce, pasta, and cooked shrimp all together, I served topped with more fresh grated Parmesan and chopped Roma tomatoes (fresh, uncooked). It was a huge hit! I was looking to make good use of the limited ingredients I currently had. So glad I found this recipe! Just made it, tastes divine!!! Will definitely be trying out more from your site. Pouring sauce over pasta is a poor way to serve a dish, especially with penne. This is a typical American cooking mistake. Toss them together before servingv to coat the pasta, and it’s noticeably better. I made this last week and my husband and I really enjoyed it! My 12 year old thought it was too salty. After tasting it again, I think she is correct, so I will either use less salt or unsalted butter. Mel, did you use regular butter or unsalted butter? I just made the sauce and my whole family loved it, even my finicky 10yo daughter. It was as easy to make as Mel says it is and full of flavor. I poured it over whole grain linguine and chicken. I browned the chicken cutlets and seasoned them with Weber’s Roasted Garlic and Herb grill seasoning. It was awesome. Thanks for the great recipes. Made this with pasta and chicken and it was delicious! Had to comment and share-if you have leftovers of the sauce it is to die for on steamed broccoli! Thanks for another great recipe! Just made this and it came out great. Thxs for sharing. Not too heavy and just tasty overall! We loved this sause! It was so delicious and simple to make. I made a couple changes though, I used 5 cloves of garlic instead of 3 and I added chives for a little extra flavor. We tossed it with shrimp and spaghetti noodles and it was amazing. This is by far our favorite sause and will be our new go to for garlic Alfredo sauce! Thanks so much for the awesome recipe !! This was so good, thanks for another great recipe!! I used low fat (neufchatel) cream cheese and 2% milk and I didn’t notice any graininess. It seemed a little thin so I stirred it quite a bit to thicken it up and then once I had it mixed in with pasta and sitting for a few minutes it thickened up perfectly. My husband loved it and I’m already thinking about how good the leftovers will be 🙂 Thank you! Made this tonight to use for a chicken alfredo stuffed shell…absolutely spectacular. It is creamy and smooth and just delicious! Thank you so much for sharing. Can I freeze this sauce? I’ve read that cream sauces don’t thaw well but technically this recipe doesn’t have cream in it. Thanks! Chris – I haven’t frozen this sauce so I’m not sure how it would fare. My guess is that it might get a little grainy after thawing but it might be worth a try. Good luck! I freeze it pretty often, and it reheats well on the stove over warm heat. I usually make a double batch and freeze half. Hope that helps! Hi Mel – I love all your recipes and tried this one for a lunch/dinner option today. I added a full brick of of cream cheese (the shame lol) but the cream cheese was greek yogurt cream cheese so I think that justifies the full brick right? 😉 I added the extra as I found the sauce a bit too think otherwise, but I used a half a cup of water to dilute the half cup of 5% cream I had to use because I didn’t have milk – I thought that was a good substitute but perhaps it wasn’t..thus I used the full brick of cream cheese. All in all it is very good – and verrryyy filling! Thanks for the fast and tasty meals! Great recipe. Never made it before. The family can’t wait till I make it again. Thanks! Made this tonight for my family get together. It was so good. It was perfectly thick. I love that I can trust you Mel. I have been cooking your recipes for about a year and they are all so good. I LOVE, LOVE, LOVE this sauce. I make it whenever I have a creamy sauce itch that needs to be scratched. Best part about it (well, besides the deliciousness) is that it’s soooooo easy! hi, i would like to know if there is substitute for parmesan cheese it’s kinda expensive here in philippines. can i used local cheese or any avail cheese what we have? Lyn – I’m really not familiar with other cheeses in the Philippines – you might look for another firmer-type cheese that melts well. Sorry I am not more help. 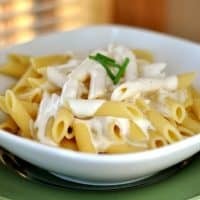 I have been looking for a alfredo recipe for days and I would like to try yours. But do u know whether I can used grated parm? TJMom – Do you mean the parm from the can? If so, I wouldn’t recommend it – it tends to make the texture more grainy. i recommend grating it yourself from a block of parm. Good luck! This recipe is absolutely AWESOME. Tonight was one of those “non-cooking” nights but I refused to order pizza for my family. So I tried your recipe and my family fell in love. Thank you for sharing! Made this as a side (on penne) with your absolutely wonderful lemon garlic grilled chicken for my kids + 2 extra picky guest kiddos & they all gobbled it up. Woot! One of my daughters said she will never eat restaurant alfredo again…only this!!! Thanks for the recipe! My kids have been dependent on restaurants for alfredo, as I will NOT buy alfredo in a jar. I do agree with them this is better than restaurant! Amen. Your blog is seriously my go-to blog for recipes I know I can trust. I have tried many sauces and this one is the keeper! We love it so much. I’ve made it a few times now and am getting ready to make it again now. Thanks for always posting the best recipes! This recipe disappointed me a little, wasn’t as great as I was hoping. Has a fairly good taste but does not really have the right consistency. A good starter recipe. Could use a few enhancements. Hi, Mel! I love this site! Question about the sauce. We loved the flavor, but it turned out grainy. Used full fat cream cheese. Shredded my own parmesan. Cooked it longer to melt the cheese. Any idea what I’m doing wrong? Thank you for your help! Andrea – Like how grainy? Like cornmeal? Adding the Parmesan slowly to let it melt a handful at a time can make a difference. I’ve noticed when I cook it too long it gets a little grainy – there’s a sweet spot of letting the cheese melt but not cooking too long, I think. Hi Mel…I just wanted to let you know how much I love your blog! I found it a little less than a year ago when I was looking for a recipe for homemade pita and I have been cooking my way through your blog ever since. Anyway my picky 3 year old loved this recipe…dinner time has been a struggle lately and he couldn’t eat this fast enough. About halfway through he stopped to say, “I love this dinner Mama!” I added chicken and broccoli and he cleaned his plate. Thanks for all your recipes and all you do! HOW did I miss this recipe? It is incredible! It was so easy and so good! Huge hit! It has already been re requested a couple of times by my husband and son. Thank YOU, Tiffany – your comment made my day! Hey there! This looks delish! Have you ever used it in a pasta bake? Wondering about making it ahead of time – pouring over slightly underdone noodles and baking it when I have a sitter coming for the kids. Thoughts? Amber – I haven’t used it in a pasta bake but I think it would be delicious! best wishes on your new bundle! This was perfection! My kids loved it and I was pleasantly surprised at how well it reheated the next day. I will definitely be keeping the ingredients for this recipe on hand. Thank you! I was looking for an Alfredo Sauce recipe to use at a “Pasta Party” dinner for my daughter’s high school volleyball team. I tripled the recipe and it turned out great! Many of the girls complimented it and came back for seconds. I saved the leftovers and have reheated them without any trouble. I’ve reheated it with and without a little extra milk and both methods have turned out fine-one a little thinner than the other. Thanks for a wonderful recipe! Delicious ! We love alfredo sauce but I always bought store bought even though I found it to be too salty. I had tried once to make it when I got a Magic Bullet. The recipe was in the little book of recipes you get with it. It was a lot of work, turned out more green than white and was way too garlicky. Needless to say I never made it again. I made this tonight for dinner and it was a hit! My fiance, who is not a fan of alfredo sauce, says this is the best one he’s ever had and he definitely wants to make it again! Thanks! Do you use fresh parmesan chesse, or just the green tub of the pre-grated stuff? Thanks! Maria – I use freshly grated Parm. This was wonderful! I served it over some sliced, marinated, grilled wild turkey and bow tie pasta. We had some leftovers that I heated up for our just home from college daughter. She said it was the best homemade Alfredo sauce she’s had :). So it’s a keeper! Simple and reheated wonderfully! THANK YOU! we loved this! I’ve tried making alfredo several times before and it’s always been a disaster and I’d be annoyed to have wasted the $ on all that butter, cream and cheese. I saw this and decided to give it one more chance …. success! my whole family loved it and it was so easy. Thanks so much for sharing! I love that it’s lower fat – I just used the skim milk I had on hand and even then it was creamy and tasty – I did add a little bit of a thickener from Kitchen Kneads, probably wouldn’t have needed that if I’d used a higher fat milk. Tried this sauce last night and it was fabulous – and super quick/easy! I never have cream on-hand, so this was a great find. I added some veggies and leftover ham to the mix to make a complete, one-dish meal. Excellent. Thanks for sharing it! Love this alfredo sauce. Ive had it in the past but lost the recipe. Now I have it back. Love it with grilled chicken and brocolli. My 20 yr. old daughter loves it because its light and semi-healthy. I adore this sauce. Tonight was a “no dinner night” but thanks to this recipe we had fettucini Alfredo with broccoli and chicken. Yum! So fast and easy and delicious! I make it with skim milk and 1/3 fat cream cheese and it comes out tasting great every time! I had no cream and tons of whole milk, was out of spaghetti sauce but had nothing but pasta for dinner. This recipe saved me! I only had about 2 oz of reduced fat cream cheese, and about 1/2 cup of parmesan cheese. I think the whole milk aided in the creaminess, though, and I just cooked it a little longer to thicken it a little more. Mixed it with peas and chopped ham and stirred it into ziti. It was fantastic! As usual, we loved the recipe!! I was worried I wouldn’t have enough sauce because I decided to toss in a bunch of fresh spinach at the last minute that I found wilting in the fridge – it was plenty of sauce for the 1/2 box of penne I used. Thank you so much for another great recipe!! Just made this for dinner tonight and my kids actually ate it and want me to make it again. So yummy!!! Will double the recipe next time so I can put a bit more on our noodles. Thank you. Been trying a few of your recipes and I’m very pleased. Jennifer – this will reheat just fine as long as you reheat over low heat. We live in Suriname (do you know where that is?) and so I can’t get a lot of convenience foods here. I am excited to try this here. However, since it so hot here year around, I tend to make my suppers in the morning when it is cooler and then re-heat right before supper. I’m not sure this will reheat well. What do you think? Not that this post needs a comment but this was delicious and simple. Thank you. Even our “no sauce please on my noodles”son decided he wanted sauce. Cant wait to try it out on an Alfredo pizza braid. So delicious!!! Another keeper recipe from you! Congrats on your new baby! I’m expecting in July and my dinners are getting lazier and lazier, but this sauce may just save my buns for the next months. Delicious! I esp like grating my own Parmesan from the brick, it seems to have better flavor. Yes, I did it gradually and left it on for longer haha. I guess next time I’ll try less milk, or maybe add some heavy cream or something. Jamie – did you add the milk gradually? Garlic powder verses garlic cloves won’t make a difference on thickness. On occasion when I’ve made this, I’ve had to cook it a bit longer for it to thicken so maybe try cooking longer or adding a bit less milk. Good luck! I just made this recipe for my dinner and I was excited because when I added the cream cheese it seemed like I found an alfredo sauce that would be thick! But as soon as I added the milk it got super thin, like water thin, and never thickened up. I used garlic powder instead of the garlic cloves, I’m not sure if that would change the thickness. It tastes great though so I’d love it if anyone had any ideas on how to make it thicker? Yum yum yum! Made this tonight for dinner, and it is definitely going on the menu for the week after the baby is born next month! Thanks for sharing! Michelle – I’ve never used it in the crockpot so I don’t know how the consistency would fare. Sorry I’m not more help – let me know if you try it! I was wondering, can i use this for the crockpot alfredo chicken? Thanks. Hey Mel! I just wanted to say that somehow I missed your pregnancy announcement way back when and just saw it today in your post! So exciting! I hope everything is going well and that you are healthy and excited. 🙂 Congratulations!! Looks like a great recipe, we will give it a try and look at the nutritionals to see how they stack up! Thanks guys! I’ll be cooking dinner for my new girlfriend for the first time tomorrow night. I think this is what I’m going to make. I’ve got to make a good first impression! AndyD – I think the simplest way to add chicken to this is to grill/broil or cook the chicken separately then slice and serve with the pasta and sauce. You could marinade the chicken many different ways or just use a simple seasoning of salt and pepper. Love this recipe! I do have a question though, how would you add chicken to this? This sauce was delicious! I used it to replace the jar alfredo sauce in this recipe… http://www.plainchicken.com/2010/11/three-cheese-chicken-alfredo-bake.html and everyone loved it!! I always feel like I’m cheating on you when I try recipes from other food blogs, but I promise you’re still my number one favorite, go-to recipe spot of ALL time!! Thanks for everything Mel!! I’ve been using a version of this for years now, actually! And when I first found it, it was titled something like “Olive Garden Alfredo Sauce.” I won’t go that far, but it is still VERY GOOD. I also make mine with light cream cheese (I agree on the slight graininess but didn’t know that’s why— I’ve never made it with full-fat cream cheese and always assumed it was the Kraft green-bottled grated parm! lol) and 1% milk. LOVE IT. So good with quickly pan-fried pounded out chicken cutlets and a nice salad. Or with broccoli in with the pasta. YUM. This is also one of my go-to “ohmygoshit’sdinnerandIhavenothingplannedyet” dinner decisions. Thanks! I have been looking for a better way to make an alfredo sauce. I will try it. I will see. And I will report back. I love Alfredo Sauce but never, even in my wildest of imaginations, did I think I could make it at home! Made it tonight and I still can’t get over that it was “me” who made it! Everyone loved it!!! Thank you so much for this delicious and oh so easy to make recipe! This is the first time I almost doubted you. Alfredo Sauce is one of my favorites & I just use a storebought jar when I eat it at home. It scared me to think of making this, anticipating the flavor I like so much, & being disappointed. Is that a little overly dramatic or what? Anyway, I should have known better than to doubt. I took a deep breath & tried this tonight & was thrilled with the result! Wow!! No storebought sauce for us anymore!! This is the same recipe I use for our “light” alfredo sauce. We also use 1% milk and light /neufacthl (sp) cream cheese. We LOVE it. I use a LOT more milk (at least double, maybe triple?) and let it cook a good long time to boil down/thicken. A belated congrats on your pregnancy announcement and also a huge thanks for this simple yet absolutely delicious recipe. This was the first recipe that I tried from your blog a couple of months ago. It was so yummy! Kept me coming back to try new recipes! Haven’t found anything that we haven’t liked so far! Thanks for all the tasty recipes! So easy, and sooo good!! I made this up real quick before my daughter’s dance class. I love an easy recipe that tastes amazing! I made this tonight and everyone in my family gobbled up their noodles without any complaints. That’s a success in my book! I really enjoyed this, although I think that I will omit the salt next time. I made this the other night and it was SO GOOD. I’ve never made alfredo sauce from scratch before but this recipe is a keeper. I’m glad I didn’t have to mess around with making a roux, makes life so much easier. The bf told me to keep this in the weekly roundup. I’m sure this sauce will be a great addition to so many dishes. Thanks again! Yummy! Looks like I’ll be cooking that tonight! YUM! Made this for dinner tonight and added sauteed chicken and broccoli on top. It was delicious! I was impressed how smooth this came out (and I even used the lowfat cream cheese!). Had great garlic flavor. Will definitely make again. I’m ALWAYS in the mood for pasta! Stumbledupon this after dinner tonight, so guess what’s on the menu for tomorrow night! Thanks! I’ve been wanting to make some homemade alfredo sauce. Thanks for the recipe! I’ll try it out next time we are in the mood for pasta! I have a similar recipe and love it. I am going to try yours, it is probably even better. We add frozen peas and ham if we have it on hand. My husband loves stuffed shells but my daughter hates anything with tomatoes. This reciepe was a hit! I made stuffed shells and did not put sauce on a couple of them. When they came out of the oven I put the no sauce ones on a plate with this sauce and they were gone first! Made this sauce last night and WOW, it was DELICIOUS! One thing though, we found the sauce a bit salty, next time I’m going to omit the salt. I will be using this recipe over and over again! Congratulations, Mel! What great news. I don’t know how you keep up with this blog with four little ones and one on the way! I sure am glad you do, though. Love this alfredo sauce! 2) This was AMAZING. Tried it tonight, best Alfredo ever. Better than restaurant! Threw some shrimp in, amazing. Definitely a keeper. Congratulations Mel!!! How exciting! I was thinking of making ravioli with an Alfredo sauce for dinner this week. I was in search of a good Alfredo sauce recipe but not anymore!! I’m sure this will taste wonderful! Oh my goodness, I made this in a pinch last week. My husband came home from work late and walked in the door and he immediately stopped in his tracks and said “whoa, that smells like flavor!” It was wonderful, I just paired it with some linguini and some chicken seasoned with italian herbs. Favorite. Mel, this is my first time commenting but definitely not the first time reading and cooking your recipes!!! As my family would say I am obbsessed!! But I wanted to thank you for all the recipes and the time of doing your fabulous blog!! I have 3 small children and am expecting my 4th and am very sick/high risk myself. I don’t know how you do it… simply amazing!! My husband works a cross the country and is home for a minute and is very excited to eat this for dinner tonight and I know it will be great! CONGRATS and good luck on your new bundle of joy! Thanks again so much!! I’m always on the lookout for good Alfredo recipes. Can’t wait to try this! Yum yum yum, not good on an empty stomach! Making this tomorrow! Congratulations Mel!! Hope all goes well for you and the little baby. Put your feet up when you can and keep eating delicious and healthy food! Made this last night for my husband. He said it was just as good as Olive Garden. I grilled some Italian sausages and put them on top. He only complained that it wasn’t a never ending pasta bowl! Thanks Mel! Mel, I made this tonight after a hectic piano teaching day and no dinner plan and my kids DEVOURED it. That is saying something! Thanks! I’m sure it will be made weekly! This is so fantastic and EASY. About 5 years ago I tried making “real” alfredo sauce and it was a disaster. I decided to try this recipe and *maybe* redeem myself, as my husband has not let me live down the previous disaster. He just ate a big bowl and said that I redeemed myself 😀 Thanks so much for sharing! This looks amazing! I’m adding it to my recipe box. More importantly, though, congratulations! I hope you have a healthy, uneventful pregnancy. Just made this for dinner tonight. YUM!! Thanks for such a simple but yummy recipe! Congrats! I’m expecting my second little one the beginning of april myself! I made this last night but added chicken and broccoli. My husband loved it and even referred to it as “restaurant quality”! I always know you can’t go wrong trying something from your blog! Thanks!! You have inspired many great dinners at my house! 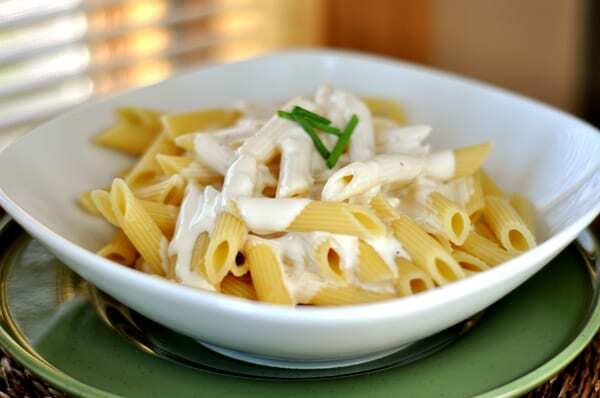 As for the Alfredo pasta, I made it last night and L-O-V-E-D that it was SOOOOO easy and quick to make! It was delish. My hubby and I are not huge fans of Alfredo but this one sounded so good and the fact that it looked like a quick meal, it won me over. I think next time I will hold off on the salt though. I forgot how salty Parmesan is so it was a little much for me. But that is an easy fix. 🙂 Definitely a keeper in my home. Thanks! I just made this tonight and it was delicious!! The only thing that I would say I had trouble with is that my parmesan cheese took a really long time to melt and get incorporated into the cream cheese/butter/garlic base. But I stuck with it and it can out great!! Congrats on your little bun in the oven!! Congrats Mel! So exciting for you and your family 🙂 Good luck with the rest of the pregnancy. This was great! I was worried at first because, even after cooking for a bit, the sauce seemed thin but it thickened up as it cooled. Even my 15 mos. old gobbled it right up. Made this tonight and it was really tasty. Definitely will be a repeat! My son at his WHOLE dinner! Congratulations!!! I am 11 weeks with my 5th. I have 4 boys and they are adament that it can NOT be a girl lol!! This recipe is going to help A LOT, this last month has been rough in the making dinner department! Congratulations!!! And thank you for saving our dinner tonight. I had broccoli and pasta and now we have Alfredo to pull it all together. Hooray!!! Congratulations! I’m 12 weeks along and trying to get back into the kitchen and the grocery store. I love cooking and I love you website. I’m hoping to regain my food energies and try more of your recipes soon. This looks yummy! I might have to invite someone over to eat it with me since the hubby doesn’t like cream cheese and the baby isn’t old enough. 🙂 Congrats on the new addition!!! So exciting. I am a first time commentor to your blog, but not a first time user. I have been using recipies for months now, and LOVE them all. Thanks for keeping our hungry bellies happy! Congrats on the baby! Congratulations!! I hope you and baby are happy and healthy during this pregnancy! I have been making a recipe very similar to this (a bit more butter and garlic powder instead of fresh garlic) for years now. I love how quick, easy, and absolutely delicious it is! Congrats on the baby! I’m expecting too, and I know how hard it is to get dinner on the table! And I only have a one year old and a hubby to worry about! Hope all continues to go well with you and your family. Congrats on the baby – how exciting! Congrats on the pregnancy!!!! I just love stalking your blog!!! P.S. Can’t wait to try this…I’ve been looking for a go-to alfredo sauce. I will be trying this soon! It looks really yummy and easy. And congratulations on the pregnancy!!! I have 4 girls and I don’t dare press my luck for another one….I would probably end up with another girl! Mel, so so happy to hear this news. YAY!!! Our babes will be a few weeks apart! I’m 11 weeks tomorrow. I hear you on being scared about announcing. We’ve had 4 miscarriages in a row, so this time around has been extremely monitored and worrisome. Just know miscarriage drops to 2% after the 10th week of pregnancy (that’s what I keep telling myself, but I’m still a basket case sometimes). Hugs to you and your cute family. I think it’s adorable you are hoping for a cute little boy. There really is nothing better in this world than little boys! A girl would be wonderful too, but little boys melt my heart in a way a girl can’t! This looks like a great one, Mel. It is the first thing to go my Friday Finds list this week. Congratulations, and I will be praying that all continues to go well with both you and baby. How exciting for your family. Sooooo excited for you! Will keep you in my prayers. Hugs! Congratulations! I love alfredo sauce!! YUM!! I’ve never knew how alfredo sauce are so easy to make. Thanks! Alfredo Sauce!!! Love it! !And add garlic to and it is soo much better!! Just thought That I would let you know that your butter and eggs are on sale again at Kwik Trip! Eggs are .99 and butter $1.99. good through 12/9! With all the baking you do and close by! Have a good week…Jules your Kwik Trip lady!!!!! Keep the recipes comin! Love them!!! wow, congrats! hope all goes well. you are incredible for keeping up with your awesome blog and a growing family behind you. must be so much work and I appreciate it a lot! Congrats indeed! How exciting! And thanks for the Alfredo recipe…..we love alfredo anything around here. I’ve tried one similar in the past, but had forgotten about it. Thx for the reminder! Congratulations! I hope your pregnancy goes smoothly and quickly and safely for you and baby! This is just how we make alfredo sauce and love it! Congratulations on being pregnant. That is great. Congrats on your pregnancy. I know that miscarriages give you a scare and it’s hard to enjoy pregnancy the same way afterwards. Hoping you have an uneventful and healthy pregnancy. The alfredo sauce looks like it will make the menu this week as DH will be at work for some dinners. Thanks! Congrats! I hope you feel well…and that things go well for you! Mel, you can’t leave us hanging like that. Congrats! When are you due? Do you know what you’re having? So exciting! I hope you are getting over the feeling yucky stage! And this looks amazing….thanks for sharing! Congratulations, Mel! Such happy news! Congrats!!!! That is super exciting! Hope you are feeling ok. I have a recipe very similar to this and we absolutely LOVE it. It’s the only alfredo I will make or eat. I refuse to make a cream/butter filled kids. yikes. I am going to try yours, because let’s be honest, everything you make is divine! Congratulations Mel on your pregnancy!! I’ll be praying for your health and the little nugget’s health!! I am positive everything will go smoothly! Congratulations, Mel, I’m so happy for you! This will be on my menu this very week! I HAVE to try this. I’m always looking for new pasta recipes. It looks amazing!! And they’re all pantry staples except for the cream cheese. Grocery store here I come!!! Thanks for posting this and congrats on your pregnancy! Yes! I’m looking forward to trying this… I’ve been looking for a delicious (relatively easy) alfredo sauce! Congrats on the little one on the way! Congratulations! Your recipes continue to be my favorites- I keep recommending your website to everyone that likes my cooking! Congratulations! Nothing like a new baby on the way. Hope all goes well for you. The alfredo sounds fantastic also. Congratulations! So happy for you! Happy and Healthy 9 (really 10) months! OBTW Congratulations, Will keep you and yours in my prayers. I have 5 children, the first four were girls and number 5 was the boy:) 20 years between my oldest and youngest. I have been usin cream cheese for the base in my alfredo sauce for years. My Italian mother would not approve if she were here 🙂 Anyhoo, I use it for my caterings, and here at the school. Sometimes I add chopped broccoli, we love grilled shrimp, stir in lump crabmeat, (better than Red Lobster) the possibilities are endless. When I have leftover veggies from a veggie tray, I toss them in evoo, roast them and stir it in the alfredo. I love tomato alfredo so sometimes I add fresh chopped tomatoes, if they aren’t in season a small can of petite diced tomatoes. Just wanted to share. Congrats Mel! Awesome news. On my third boy I never told anyone that I hoped it was a boy because everyone assumed I wanted a girl and thought I was crazy for wanting another boy! I can’t wait to try this Alfredo…. Congratulations! That is such fantastic news! I haven’t made my menu for the week but I am sure this sauce will be one of the dinners. I am positive all of my family will like it! Thanks, everyone! I’m only about 14 weeks along and even then hesitated to share the news thanks to a miscarriage earlier this year and some previous health concerns that have made this pregnancy high-risk. But things are going better and we hope to have a healthy baby here in April! Of course my four boys are dying to know if they are going to get a little sister (and I don’t have the heart to tell them that I still have my hopes up for a sweet little boy). Thanks, again! Congratulations! I am 26 weeks pregnant and completely understand the need for quick, simple meals. Congrats! When pregnant with my first (some 15 years ago…oh gosh that makes me feel old) Alfredo was something I just couldn’t look at. I am glad to say that once I had him that all went away. This looks fantastic! Hope you are feeling well, and no aversions to food. This is almost EXACTLY like the kind I make [ I add a cup more milk and 1/2 cup more freshly shredded parmesan]. And you aren’t kidding about it being the one dish I know ALL of my 3 finicky little ones will actually eat! So glad you found it, especially at such a time when I know it’s hard [did I mention about the THREE kids?] to get inspired at dinnertime. Congratulations! Congratulations! How exciting! This recipe looks great. My kids love alfredo sauce much more than meat or marinara sauce. They always order it out at restaurants. Occasionally, I buy the jarred stuff for them. Not very tasty, but they like it. I will have to try this. Thanks so much! I’m sure this recipe is delicious but more importantly – congratulations!!!! You rock!!!! 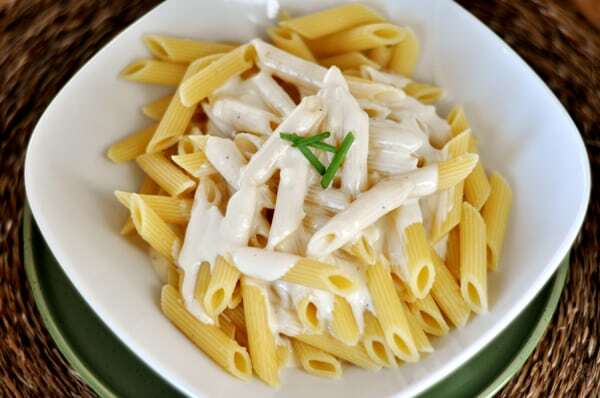 I make an alfredo sauce almost exactly like this one and we love it!! Easy and one my whole family gobbles up. Congrats on the upcoming arrival!!! Congratulations! That is very exciting news. I’ve never been an alfredo sauce girl, but with such praises from you, I’ll have to try it. Congratulations! How far along are you? I’m coming up on 20 weeks and am way into food. Hope you’re feeling well!